LED lighting is quickly becoming the lighting of choice and replacing halogen bulbs in design. While LED lighting used to have a stigma of being a cold, harsh lighting, you can now buy it in warmer tones such as white and warm white; both have great uses around you home and especially in your kitchen. Ceiling lighting – Transitioning to LED lights for overhead lighting used to be difficult. 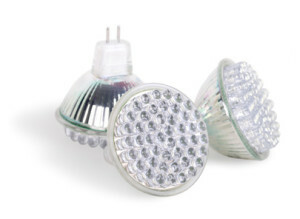 Now most LED can lighting comes with an installation kit that makes the process much easier. Highlighting Architecture – If you have an interesting cut-out in your ceiling, LED lighting is a great, low profile way to highlight it. You can also use it to highlight molding at the top of your cabinets so that it doesn’t get lost with the height of your ceiling. Under Cabinet Lighting – Using LEDs is a no brainer when it comes to under cabinet lighting. The low profile lighting is easy to install under cabinets and the heat it emits is so little that you won’t worry about heating anything underneath the light. Glass Front Cabinets – LEDs are perfect for lighting glass-front cabinets. They add a great effect and help showcase your serveware. In-Cabinet Lighting – The inside of cabinets and drawers are very dark places. Instead of losing items to the darkness, add LED lighting inside your cabinets and drawers to help you find items you need. Track Lighting – If you have high ceilings and can lights won’t do the trick, adding LED track lighting will help brighten up the room. With low heat emission and bright light, LED track lighting is a great solution to the problem. Toe-Kick Lighting – Creating a great ambiance in your kitchen, LED strips at the toe-kick of base cabinets is a great idea. Toe-kick lighting can also help those who try to navigate through the kitchen in the dark. These energy-efficient lights can be left on all night without killing your wallet. Changing from halogen lighting to energy-efficient LED bulbs doesn’t have to mean that you give up the style and warmth of lighting. With those simple solutions, you can still have a well-lit space that is easy on the wallet.